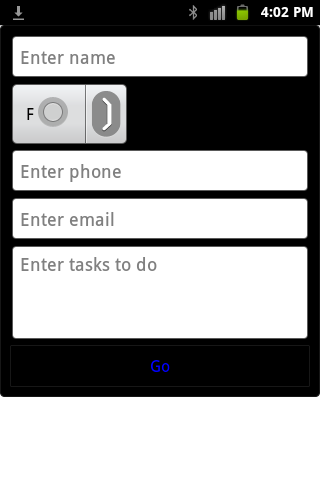 In this post, you will learn to create a simple NotePad app for Android. The NotePad app can be used to view files that contain text inside. These files can be txt, html, xml, and java files. You can open the app and then browse for a file to open or alternatively you can select a file from Android to open. The current document can be edited and saved. The user can create a new file by clicking the new document icon from the action bar. 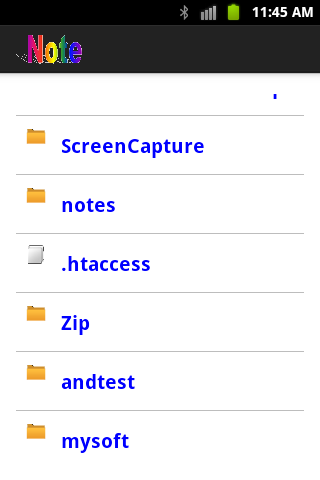 The new file will be stored in the notes directory of external card of the device. To start developing the NotePad app, now you need to create a new project. The project name will be NotePad. There are two activities in this app. The first one is the MainActivity that firstly runs when the NotePad opens. This activity represents the interface that allows the user to select a file to open. This MainActivity will list files and folders in the external card of the device. Below is the content of the activity_main.xml file. In this file, one ListView component is defined. 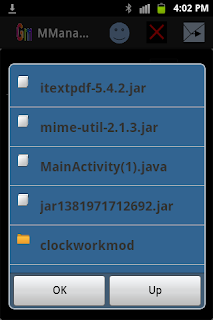 The ListView will display the list of files and folders for selection. Each row or item of the ListView displays both image and text. The image will be the file icon image or directory image. Thus it must be customized to work in this way. When customizing the ListView, as i mentioned in the previous posts, you need to define the layout file of the list and the data source of the list. Here is the content of the listlayout.xml file of the list. The data source of the list will be an instance of the class that extends the ArrayAdapter class. I call it ListAdapterModel class. You can download the ListAdapterModel.java file from here. To get explanation about customizing the data source of the ListView, you might want to read the File Chooser post. When a file is selected from the list, another activity will open and the content of the file is shown there. The data to be sent from the MainActity of the second activity (NoteActivity) is the full path of the file. The openNoteActivity method of the MainActivity class will be called to send the path file to the NoteActivity. Click the MainActivity to download the MainActivity.java file. On the NoteActivity, you will see the content of the selected file. The EditText component is used to display the file content and allow the user to edit the content. Below is the layout file of the NoteActivity. You can download the NoteActivity.java file from here. The NoteActivity has an action bar. To support the old Android versions, the NotePad app uses the SherlockActionBar library to set up the action bar. You might want to read TexViewer to learn how to import this library in to your project. On the action bar, there are four items. The first item represented by the new document icon will be clicked to call the createNew method so that a new blank document will open. The second item allows you to save the edited document by calling the saveWork document. The third and forth items allow you to zoom in or zoom out the content of the current document by calling the zoomin and zoomout methods.. The items of the action bar are defined in the note.xml file that is stored in the menu folder of the project. Before running the NotePad app, you need to edit the AndroidManifest file of the project to allow the app to use the external sdcard and to register the app in the list of avaiable apps to open the selected file. Here is the content of the AndroidManifest.xml file. This is an Assignment Manager app for students. The Assignment Manager app can be used to store information about your assignments and people in each assignment. You can add new assignments to the database or delete assignments from the database. It will alert you three days in advance before the deadline of the assignment. It allows you to add people to an assignment and delete people from the assignment. You are easily to share information about the assignment and group members with file attachment to all members in the assignment. To start developing the Assignment Manager app, you need to create a new project in Eclipse. This application name will be called AssMger. There are two activities in this app. The first one, the main activity or user interface that lists the recent added assignments, allows the user to add new assignments to the database, to delete assignments from the databases, and to open another activity to manage people in the selected assignment. By pushing the detail button (>>) next to the assignment, the assignment detail will be shown on the dialog. Each assignment contains the following information: id, topic, description, lecturer/teacher name, room number/code, and deadline. To open the user interface for managing the members in the assignment, you will push the member button (next to the detail button). These buttons are available only if there is at least one assignment in the list. The SherlockFragmentActivity class is used to construct the main interface. The AManager class extends SherlockFragmentActivity to represent the main interface.The layout file of the AManager class simply contains a FrameLayout. The FrameLayout is the container of all sub-interfaces. This layout file is called activity_amanager.xml. You can download all layout files in this app from here. On the main interface, there are two sub-interfaces that will be added and removed dynamically. One sub-interface is defined by the AssListFragment class that extends the SherlockFragment class. This sub-interface will be shown when the showAssList method of the AManager class method is called. The layout file (asslist_view.xml file) of the AssListFragment class contains a ListView component. The ListView component is used to display assignment icon, assignment id, detail button, and member button. So each item of the ListView contains four elements. Here is the content of listlayout.xml file that defines the four elements of the ListView. Each button has the same background style. The background style for all buttons in this applications is defined in the bt_style.xml file that is stored in the drawable folder. The ListModelAdapter class that represents the data source of the ListView is defined in the ListAdapterModel.java file. If you are new to the ListView customization, you will need to read FileChooser page. By pushing the detail button (>>) , the showDetail method of the AManager class displays the detail of the assignment in a dialog. The dialog is displayed by calling the showAlert method of the MessageAlert class that is defined in the MessageAlert.java file. When the member button (represented by the human icon) is clicked, the linkToMember of the AManager class is called to open another activity that lets you add members to the database, delete members from the database, and share information to all members in the assignment. Another sub-interface allows you to add a new assignment to the database. This sub-interface defined by the AddAssFragment class displays when the user touches the new icon from the action bar. The showAddAssForm of the AManager class is called to display the sub-interface. On this interface, you will fill all required information about the new assignment and press the Go button to invoke the addAss method of the AManager class to add the assignment information to the database. The items (represented by the new and delete icons) of the action bar are defined in the amanager.xml file that is in the menu folder. All icons of the items are stored in the drawable folder. You can download them from here. The new icon will be pushed to pop up a form that lets the user fill in the assignment information and add the information to the database. By selecting an assignment from the list and pressing the delete icon, the deleteAss method of the AManger class will be invoked to delete the assignment from the database. This will also delete all people in the assignment from the database. In this app, the SherlockActionBar library is used to set up the action bar so you need to import the SherlockActionBar project in to the Assignment Manager app. If you are new to SherlockActionBar, please read the TextViewer post. It helps you get start setting up action bar by using the SherlockActionBar library. Another activity is called MManager class. It is defined in the MManager.java file. The second activity is launched when the user clicks the member button from the main activtivity (AManager). The second activity allows you to add people to the selected assignment, delete people from the assignment, and share information about assignment and people with file attachment to all people in the assignment. Similarly, on the MManager activity there are two sub-activities or interfaces. One sub-activity that extends the SheklockFragment class is called MemListFragment. This sub-interface shows a list of people in the assignment. 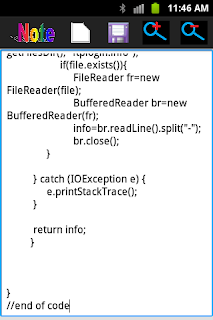 Here is the content of the MemListFragment.java file and its resource layout file (memlist_view.xml). If you want to view the detail about a person, click the detail button (>>) next to the name of that person. This will show a dialog that contains the detail about the person. The ListView used in the MemListFragment also must be customized to show the human icons, person's names, and the detail buttons. So each item of the ListView has three components that need to be defined in its listlayout_member.xml file. The data source of the ListView is defined by the ListAdapterModelMember class. Click here to download the ListAdapterModelMember class.java file. The MManager class also has its own layout file that will be used as the container of all its sub-interfaces. This layout file is called activity_mmanager.xml file. Another sub-activity or interface is defined by the AddMemFragment class. This sub-activity allows you to fill in the required information about a person of the assignment and add the person in the database. Here is the content of the AddMemFragment class and its layout file (mem_add.xml). The MManager activity also has the action bar. The action bar contains three items that are defined in the mmanager.xml file stored in the menu folder. The first item of the action bar is the new icon. It will be touched to show the AddMemFragment interface by calling the addMember method of the MManager class. By clicking the delete icon, the selected person will be removed from the assignment by calling the deleteMemer method of the MManager class. The last item allows you to display the file chooser dialog for file attachment and send all information about the selected assignment and its members with file attachment to all members in the assignment by calling the sendEmail method of the MManager class. The FileChooser class is constructed as sub class of the MManager class to show the file chooser dialog and handle file and folder section. The FileChooser also use a ListView component to display files and folders for selection. This ListView also customized to display both icons and text. Here is the content of the layout file of the ListView used in the FileChooser class. For the complete code of the ListAdapterModelFileChooser class that acts as the data source of the ListView can be download from here. There are some string variables that are used in different layout files of the app. These string variables are defined in the strings.xml file. Here is the content of the strings.xml file. As i mentioned above, the Assignment Manager is able to alert the user three days in advance before the deadline is reached. In Android, we can accomplish this task by using the AlarmManager class and NotificationManager class. 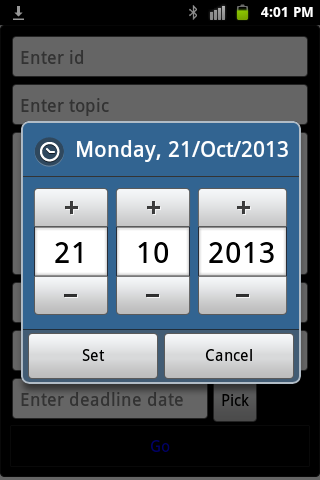 The AlarmManager class is used to schedule the date and time to notify the user. The NotificationManager class will be used to handle the notification to the user at the specified date and time. In the AManager, there is a method called setUpAlarm. This method will be invoked immediately after a new assignment is added to the database. This method accepts the number of days between the current date and the deadline to be its argument. This number of days will be subtracted by 3. The result of the subtraction will be added to the Carlendar object so that the date to alert the user is in the future that is three days before the deadline. The number of days between the current date and the deadline is calculated by using the Days class of the Joda-Time library. You need to copy and paste the Joda-Time library jar file to the lib folder of the project. The setUpAlarm method specifies the PendingIntent object and the date and time to send this intent object to the broadcast receiver. This date and time will be three days before the deadline of the assignment. The broadcast receiver defined in MyReceiver class that extends the BroadcastReceiver class will get the intent object sent from the alarm mamanager. Then the notification object is constructed to handle the notification to the user. Here is the content of the MyReceiver class. This broadcast receiver has to register in AndroidManifest.xml file so that it can receive the intent sent from the alarm manager. The content of the AndroidManifest file is modified to the following. 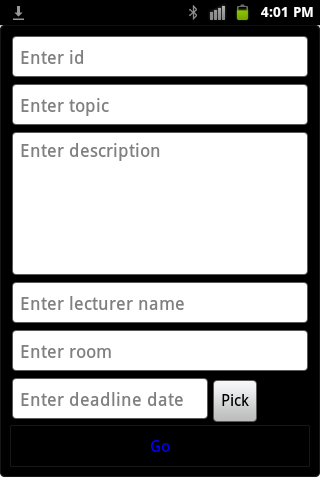 The Assignment Manager app uses SQLite database to store information about assignments and members of the assignments. The DataHelper class is written to help us in creating database and tables. Here is the content of the DataHelper class. MetaInfo.COL_NAME_TOPIC+" TEXT, "+MetaInfo.COL_NAME_DES+" TEXT, "+MetaInfo.COL_NAME_LEC+" TEXT, "+MetaInfo.COL_NAME_ROOM+" TEXT, "
When you create an instance or object of the DataHelper class, its constructor is called to create a database file (if it does not exist). The onCreated method will be called automatically after you create the instance or object of the DataHelper class. This will create two tables (if they do not exist). One table is for storing the assignments' information and another one is for storing the people's information. The names of the tables and their columns or fields are defined in the DDSchema class. 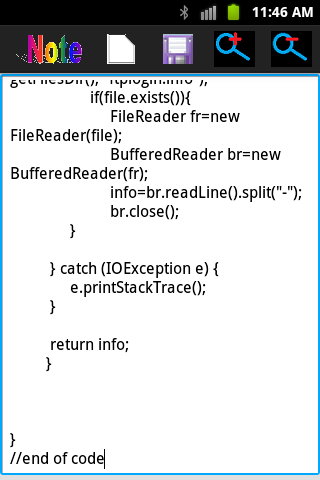 Here is the content of the DDSchema.java file. The DataHelper class is used in both the AManager class and the MManager class. The readAss of the AManager method is called from the showAssList method to retrieve the assignments'information from the tblassigments table and show them on the list. Its addAss method will be called to insert the new assignment to the table. Similarly, in the MManager class, the readMem method is called from the showMemList method to retrieve people's information from the tblmembers table. Its addMember method will be called to insert a new person'information to the table. On the AddAssFragment interface that allows you to fill in the new assignment information and submit the information to the database, you will see the Pick button. 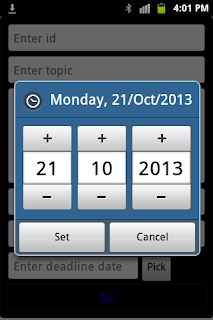 This button allows you to select a date from the date picker dialog. The date picker dialog can be created by using a dialog fragment class that implements the DatePickerDialog.OnDateSetListener. In the Assignment Manager app, the DateDialog class (the inner class or sub class of the AManager class) extends the SherlockFragmentDialog is written to provide the date picker dialog to the user. Now you are ready to try the Assignment Manager app. If you have any questions, please feel free to leave them at the comment section below. You can download the Assignment Manager apk file to install on your Android device from the link below. In this tutorial, you will learn to create a Folder Locker app. The Folder Locker is used to lock a folder so that all files and sub folders in the folder can not be viewed or read by other people. To lock a folder, you need to provide password in the password text box and push the Lock button. When the folder is locked, the locked icon will display instead of the normal folder icon. The locked folder can be unlocked if you provide the correct password used to lock the folder. You will push the Unlock button to unlock the locked folder. Now open your Eclipse and create a new project. The project name will be FolderLock. For this Folder Locker app, its interface is simple as the File Lokcer interface. We need one EditText to allow the user to input the password, two Buttons for locking and unlocking the folder and one ListView to display the list of files and directories for the user to choose. These components are defined int he activity_main.xml file that is the resource file of the MainActivity class. Its content is shown below. The file that applies background style to the interface is called back_style.xml. It is saved in the drawable directory of the project. In the drawable directory you also need to have three small image files. One is file icon image. One is directory icon. And the last one is the icon image to represent the locked folder. You can download these images from here. The string values that are used in the activity_main.xml file are defined in the strings.xml file. This is the content of the strings.xml file. Again, we need to customize the ListView to display both images and text. This can be accomplished by defining the components for each item of the ListView in its layout file. Then you need to customize the ArrayAdapter class to supply both images and text to the ListView. You will have a class that extends the ArrayAdapter class. The object of the class will be the data source of the ListView. Here are the content of the listlayout.xml file and ListAdapterModel. java file. The ListAdaperModel stored in the ListAdapterModel.java file extends the ArrayAdapter class. //set the locked icon to the folder that was already locked. To help in locking and unlocking a folder, we also need a Locker class. The Locker.java file defines a class called Locker. This class contains methods that will be used in locking and unlocking folder processes. You will click this Locker.java to download the complete Locker.java file. Locking and unlocking the folder is similar to locking and unlocking a file. First you need to package the folder in a single zip file. Please read the post Zipper to learn how to zip and extract files and folders. Then the zip file is encrypted so that it can not be extracted or viewed or extract by other apps. The technique to encrypt and decrypt the zip file here is the same as the technique used in the File Locker app. So you can read the explanation on how to encrypt a file on page File Locker. Now we take a look at the MainActivity class that is in the MainActivity file. Here is the complete MainActivity.java file of the Folder Locker app. The content of the MainActivity.java file in the Folder Locker app is nearly the sample as the content of the MainActivity.java file in the File Locker app, except that the lockFile and unlockFile methods are changed to lockFolder to unlockFolder. Again, in the onStart method of MainActivity class, the ListView component is registered to the item click event so that the ListView is responsive and update its contents when its item is selected. The listDirContents method is invoked to display files and directories in the /mnt directory. The selection style of the list is defined by the selection_style.xml file that is stored in the drawable directory. The lockFolder and unlockFoler methods are called when the user pushes the Lock and Unlock buttons. The locking and unlocking folder processes are wrapped in the AsncTask classes so that they can be performed in background without locking the user interface. Before running the Folder Locker app, you need to take a look at the MessageAlert class. Simply, this class has the showAlert method to display the alert message to the user when he/she does not enter the password before locking or unlocking the folder, when the incorrect password is entered to unlocked the folder, and when the user tries to select a file instead of a folder to lock. The Folder Locker does allow the user to lock folder only.